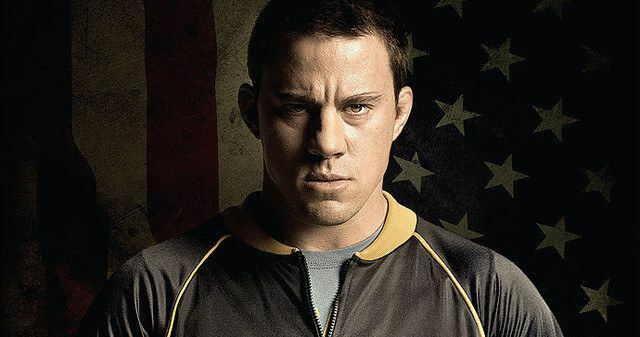 A new teaser poster for Foxcatcher has arrived, featuring star Channing Tatum as real-life Olympic wrestling champ Mark Schultz. The man's brother and gold-medalist winner Dave (Mark Ruffalo), was murdered by his athletic team's sponsor, John Eleuthère du Pont (Steve Carell) in 1996. Foxcatcher recounts the horrific events that led up to this true world tragedy. Take a look at Channing in his tracksuit, ready to face his harsh destiny, and then read on for more details about the upcoming Academy Awards contender. Will this prove to be Channing Tatum's first grab at Oscar gold? Foxcatcher has already nabbed Bennett Miller the best director award at this year's Cannes Film Festival. The drama is set to hit theaters this November, with career defining performances from its three leads, Steve Carell, Channing Tatum and Mark Ruffalo as they all take on roles that push their talents forward as actors, giving us something we've never seen before from the trio. Speaking with People, Channing Tatum described the feeling on set as the serious tone gripped everyone by the heart. "It was not a fun experience at all. It was grueling, and it was painful, but it was worth it." "I missed a stud [in the wall] by about two inches. But the cut [on my head] and the blood were real." When Olympic Gold Medal winning wrestler Mark Schultz is invited by wealthy heir John du Pont to move on to the du Pont estate and help form a team to train for the 1988 Seoul Olympics at his new state-of-the-art training facility, Schultz jumps at the opportunity, hoping to focus on his training and finally step out of the shadow of his revered brother, Dave. Driven by hidden needs, du Pont sees backing Schultz's bid for Gold and the chance to "coach" a world-class wrestling team as an opportunity to gain the elusive respect of his peers and, more importantly, his disapproving mother. Flattered by the attention and entranced by du Pont's majestic world, Mark comes to see his benefactor as a father figure and grows increasingly dependent on him for approval. Though initially supportive, du Pont's mercurial personality turns and he begins to lure Mark into an unhealthy lifestyle that threatens to undermine his training. Soon du Pont's erratic behavior and cruel psychological game-play begin to erode the athlete's already shaky self-esteem. Meanwhile du Pont becomes fixated on Dave, who exudes the confidence both he and Mark lack, knowing that these are things even his money cannot buy. Fueled by du Pont's increasing paranoia and alienation from the brothers, the trio is propelled towards a tragedy no one could have foreseen. Foxcatcher is a rich and moving story of brotherly love, misguided loyalty and the corruption and emotional bankruptcy that can accompany great power and wealth.